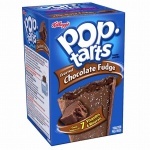 Pop Tarts are Kellogg’s most popular brand in the United States. Each day, millions of Americans place a couple of pop tarts in the toaster for a quick and convenient snack. Pop Tarts come in many flavours, but about the most popular in America is this frosted cookie and crème. If you have never eaten a pop tart, you are in for a treat. These rectangular, pre-baked pastries can be eaten cold, but are much tastier when they are quickly cooked in the toaster or microwave. It is the delicious fillings that makes them really stand out, and none are as special as frosted cookies and crème. This pack of 8 Pop Tarts (10 ounce/400 gram) provides enough to treat the kids, but also makes for delicious snacks for adults. With sweet, white frosting sprinkled with cookie crumbs between two layers of thin pastry crust, these Pop Tarts have a delicious vanilla cream filling that is just scrummy. These Frosted Cookies and Crème Pop Tarts are great for anybody with a sweet tooth and are easy to store, as they don’t need to be kept in the fridge. If you want a simple snack, or want a treat for a kid’s party, then these Frosted Cookies and Crème Pop Tarts are just the thing. Ready in minutes, a couple of Pop Tarts makes for a great breakfast, and will easily keep you going until lunch. If you like Danish pastries,you will love these. Enriched Flour (Wheat Flour, Niacin, Reduced Iron, Vitamin B1 [Thiamin Mononitrate], Vitamin B2 [Riboflavin], Folic Acid), Sugar, Dextrose, Soybean and Palm Oil (with TBHQ for freshness), High Fructose Corn Syrup, Cocoa (processed with Alkali), Cracker Meal, Corn Syrup, contains two percent or less of Whey, Salt, Modified Corn Starch, Leavening (Sodium Acid Pyrophosphate, Baking Soda), Calcium Carbonate, Egg Whites, Caramel Color, Color added, Mono- and Diglycerides, Palm Oil, Cornstarch, Sodium Stearoyl Lactylate, Gelatin, Natural and Artificial Flavor, Soy Lecithin, Vitamin A Palmitate, Niacinamide, Reduced Iron, Vitamin B6 (Pyridoxine Hydrochloride), Vitamin B1 (Thiamin Hydrochloride), Vitamin B2 (Riboflavin). Contains - Wheat, Milk, Egg and Soy Ingredients.